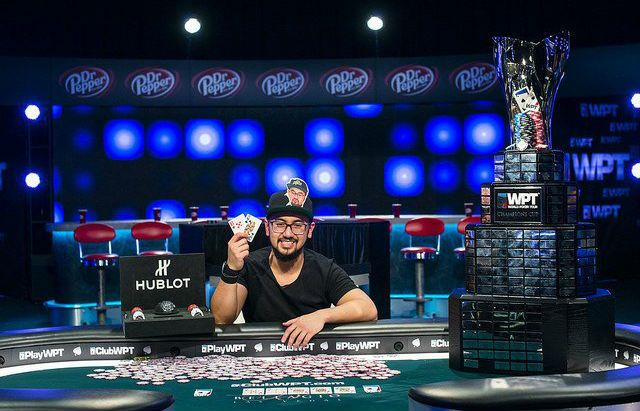 One year ago Ryan Tosoc outlasted everybody but James Romero to win the World Poker Tour Five Diamond Classic. Sunday night at the Bellagio he did one better, beating Alex Foxen heads-up to win the WPT Five Diamond and $1.9 million. It took just over 90 minutes for the first elimination of the final table. Richard Kirsch raised to 150,000 from the cutoff, Mike Del Vecchio re-raised to 500,000 from the small blind. Kirsch moved all in for 1,180,000 and Del Vecchio called. Kirsch tabled but found himself behind Del Vecchio’s . The board ran out to eliminate Kirsch in sixth place. Just 30 minutes later, another player was sent to the rail. Sean Perry, who came into the final day with the chip lead, raised to 120,000 from the button and Ajay Chabra called from the big blind. After the flop, Chabra check-called Perry’s 220,000 bet. The turn was the . Chabra checked again and Perry bet 500,000. Chabra eventually check-raised to 1,450,000. Perry moved all in for 7,765,000 and Chabra called all in. Perry tabled while Chabra had . The river was the and Chabra was eliminated in fifth place. A few hands after giving up the chip lead to Alex Foxen, Perry’s attempt at winning the tournament that began the day he turned 21 was cut short. Foxen opened to 180,000 from UTG, Del Vecchio made 520,000 from the button, Perry moved all in for 3,345,000 from the small blind and Tosoc called from the big blind. Foxen and Del Vecchio both folded and Perry tabled while Tosoc showed . The flop came to hit both players to keep Tosoc ahead. The turn was the and the river completed the board, and eliminated Perry in fourth. Del Vecchio, the only previous WPT champion to make the final table, was eliminated just 15 minutes later. Foxen raised to 200,000 from the button and Del Vecchio moved all in for 2,280,000 from the small blind. Tosoc called from the big blind and Foxen folded. Tosoc tabled while Del Vecchio was live with . The flop changed nothing and neither did the turn or river to send Del Vecchio out in third place. Heads up play began with Tosoc holding about 60% of the chips in play. While the first four eliminations of the final table took 75 hands, it took Tosoc another 49 to pick up the final elimination and secure his victory. Tosoc raised to 500,000 from the button, Foxen moved all in for 2,900,000 and Tosoc called. Foxen was ahead with to Tosoc’s but the runout gave Tosoc a king-high straight to end the tournament and make the Tosoc the final WPT champion of 2017.